Advances research on the governance of social-ecological systems with a special emphasis on resilience – the ability to deal with change and continue to develop. The Centennial Challenge was launched in 2013 to enable 100 cities to better address the increasing shocks and stresses of the 21st century, and to receive technical support and resources to improve their urban resilience over three years. Helps communities around the world address environmental, economic, and social challenges to build a better future shaped and shared by all. 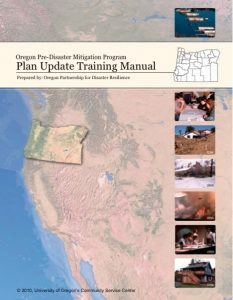 Established by Senate Bill 33, it is tasked to facilitate a comprehensive and robust plan to implement the strategic vision and roadmap of the Oregon Resilience Plan for responding to the consequences of naturally occurring seismic events associated with geologic shift along the Cascadia subduction zone. The network facilitates open communication, discussion, and resource sharing between university/college emergency management practitioners charged with making university campuses disaster resilient. Support US citizens and first responders to ensure that as a nation we work together to build, sustain, and improve our capability to prepare for, protect against, respond to, recover from, and mitigate all hazards. This plan update manual summarizes the federal requirements for plan updates and provides the resources and tools for assisting your community in updating your NHMP. In addition, this update manual provides guidance for integrating mitigation strategies into existing plans and policies to facilitate implementation. Provides earth science information and regulation to make Oregon safe and prosperous. Maintains an emergency services system by planning, preparing and providing for the prevention, mitigation and management of emergencies or disasters that present a threat to the lives and property of Oregon state citizens. Provides for protection of people and property from natural hazards through sound land-use planning. Serves the state, region and nation through integrated research, education and public engagement on ocean and coastal issues.